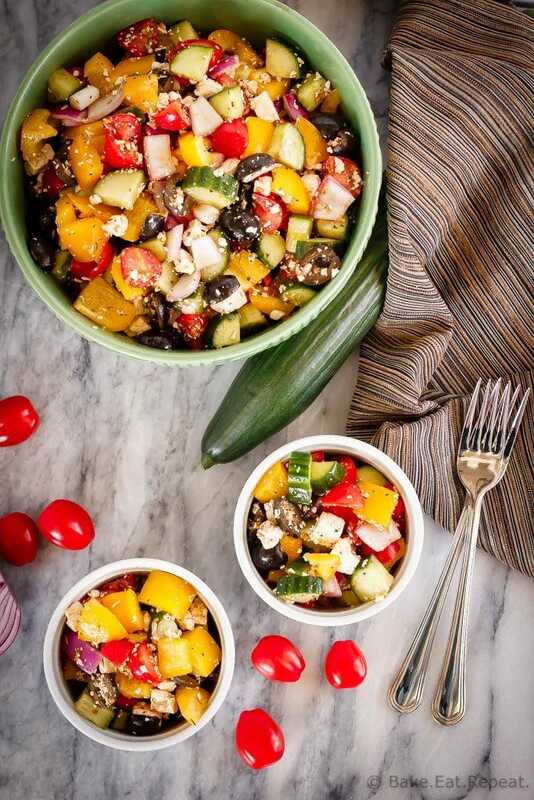 This simple Greek salad is the perfect side dish – the homemade dressing takes just minutes to make, and the salad can even be mixed up ahead of time! This simple Greek salad is one of my all-time favourite side dishes to make. It’s so quick and easy, and well, I love Greek salad! All those fresh veggies (in a salad that can easily be made ahead of time and still tastes fantastic) and the lemony dressing – it’s just the perfect side dish. We love this salad with grilled chicken or fish and some garlic bread – a simple, easy and delicious meal. 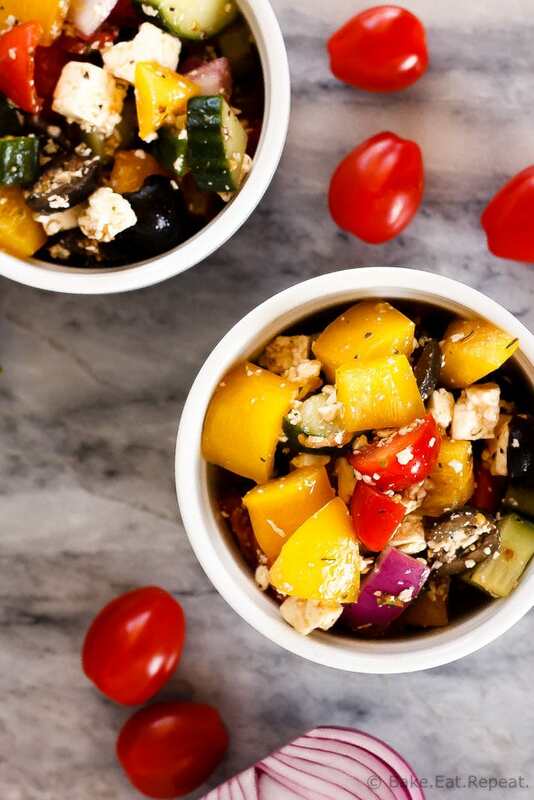 Even with all the chopping, this Greek salad comes together quite quickly. The dressing mixes up in no time at all and you can even toss it all together well before eating. It’s one of those salads where the veggies actually stay crisp and delicious even after the dressing is added. Although you could certainly just get it all ready to go and toss the salad with the dressing right before eating if you like. I really love that every time I make this salad we can enjoy the leftovers for several days and it still tastes fantastic – most salads are no good after they’ve sat for a bit with the dressing on them! It’s definitely a good thing this one stays tasty for days because my kids are not fans – so my husband and I end up eating a LOT of Greek salad whenever I make it. It makes absolutely no sense to me that the kids won’t eat it because they all love every component in this salad except for the onions. But mixed together? Horrible. Obviously. I’m going to miss the leftovers when they realize how good this Greek salad is. I have this lemon zester and love it – it’s really easy to use if you’re looking for a good one! here are a few great main dishes to serve with this Greek salad: Greek Chicken Kabobs with Tzatziki Sauce, Honey Lemon Baked Salmon, or One Pot Lemon Thyme Chicken and Rice. 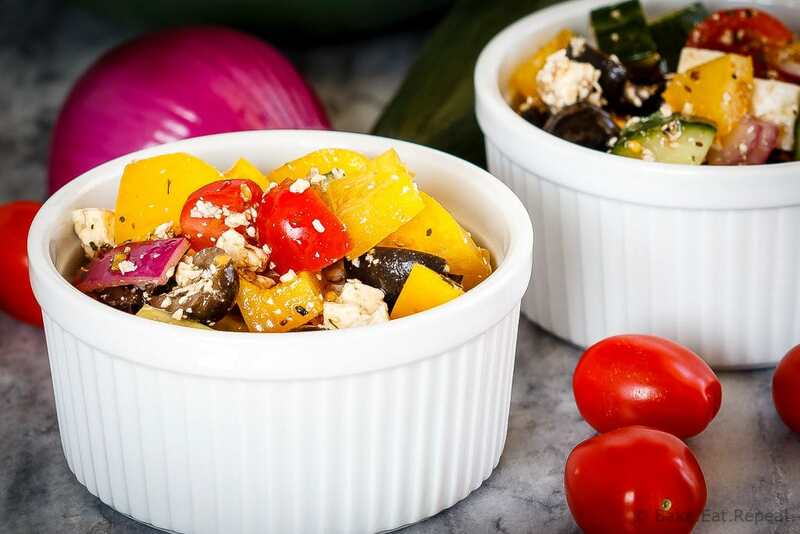 I’ve also shared this Greek Salad Recipe over on Food Fanatic.